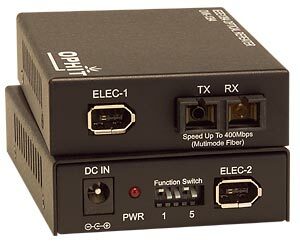 The XTENDEX?Firewire Optical Extender extends a firewire device up to 1,000 meters (3,280 feet) using multimode fiber optic cable. The local and remote units connect using multimode fiber optic cable. Complies with 1394a and 1394b standards. Works with 1394b at speeds of 400, 200 and 100 Mbps, and with 1394a at speeds of 400, 200 and 100 Mbps. Extend a firewire device up to 500/1,000 meters (1,640/3,280 feet). Using 50/125um cable, extend up to 1,000 meters (3,280 feet). Using 62.5/125um cable, extend up to 500 meters (1,640 feet). A/V Broadcasting and Editing (printers, scanners, digital cameras/camcorders, digital audio recorders). Compatible with computers with 1394 outputs. Compliant with IEEE 1394b and IEEE1394a-2000 specifications. Supports 62.5um and 50um multimode fiber optic cable. One optical port with SC connector. Two 6-pin IEEE 1394 connectors. 4.5 meter male 6-pin to male 6-pin 1394 cable.